BARNSLEY have signed FC Halifax Town captain Marc Roberts on a three-year deal. The move sees the 24-year-old complete a move to his hometown club and the centre-half, one of the Shaymen’s stand-out players in 2014-15, has professed his delight at linking up with the Reds. 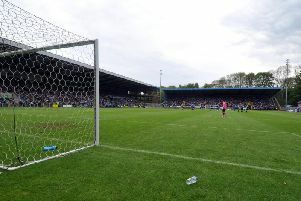 Roberts was named as Halifax’s player of the season at their recent awards night and was widely expected to move on at the end of the campaign, with the stopper’s contract expiring. Roberts made 93 appearances for the club, with his form monitored by several Championship clubs, including Birmingham City. Blues boss Gary Rowett admitted to following the form of the England C defender earlier this year, with Roberts having cut his teeth in non-league circles with Buxton before joining Halifax. His form last season also saw him lift Halifax’s official website’s player of the season accolade. On joining Barnsley, Roberts said: “I’m happy to get it sorted and I can’t wait to get going. “I’ve always wanted to sign for my hometown club, and now it’s finally here - I can’t wait. “The gaffer (Lee Johnson) here is great and I’m looking forward to working for him. “I had a conversation with him and it tipped it in Barnsley’s favour.